You’ve been waiting all summer, but now it’s almost here—the kickoff to football season! Even better, your patience is being rewarded with a free preview of NFL RedZone so you can get into the action now. You’ll have not one but FOUR chances to give it a try, including the first Sunday of the regular season! Your sneak peek at NFL RedZone will take you from game to game so you never miss a moment. 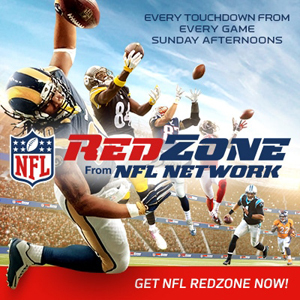 Whether you’re a die-hard, a fantasy player, or just a fan of the game, NFL RedZone is for you. (Heck, even if you’re not a huge fan, but want to catch all the key moments so you can talk with your coworkers on Monday, NFL RedZone is for you!). After you give it a try, call 1-866-44-TDSTV to order NFL RedZone for $42.99 for the entire season.